Thursday, November 16, 2017, 9:30 a.m. - Saturday, November 18, 2017, 3:30 p.m. Marketplace hours: 9:30am - 3:30pm, November 16, 17, and 18. The historic Villa will be decorated in its holiday splendor! 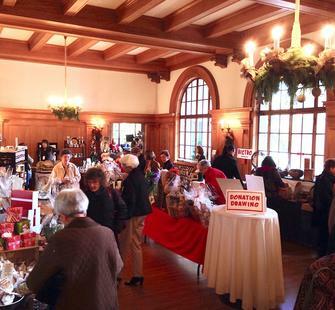 The Yuletide Marketplace features dozens of vendors offering unique gift items throughout the Villa. You'll find holiday art and decorations, collectables, photography, clothing, crafts, and specialty gourmet food items that make great gifts for your friends and loved ones. Spend a day at Montalvo and get your holiday shopping done early! A bistro is open for lunch and drinks each day of the Marketplace. Reservations at the bistro are $15 for adults and $10 for children under 10. Lunch includes your choice of sandwich (turkey or roast beef), plus a salad, cookie, and coffee/tea. Wine can be purchased separately. Reserve your spot at either 11:30am or 1pm.